Print birthday card, Christmas Card, Post Card or greeting card is an interesting and creative way to share your company latest promotion, upcoming events or even reward your existing loyalty customer. Direct mail marketing is still one of the most effective ways to advertise in today digital world, especially if company customised their post card printing or greeting card printing. It seem more personable than other marketing collateral today. Furthermore, by adding a unique personal message will let the customer feels like you are really care about them and difference. This is a high quality paper with 260gsm and glossy surface. The printed color is smooth and bright on this paper. Colors printed on 260gsm artcard and process with single side matt lamination. The card surface is protected by matt lamination which water and tear resistance. The surface of material is matt, smooth and final thickness is near 300gsm. It will be giving you a feeling of quality when holding. 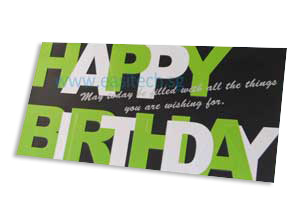 With a single side matt lamination, you could hand write your greeting or message on other side. Colors printed on 260gsm artcard and process with single side matt lamination. 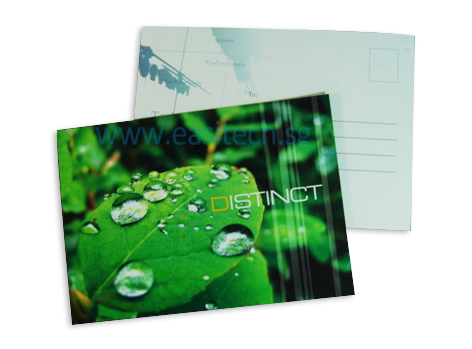 The card surface is protected by gloss lamination which water and tear resistance. The surface of material is glossy, smooth and final thickness is near 300gsm. It will be giving you a feeling of quality when holding. 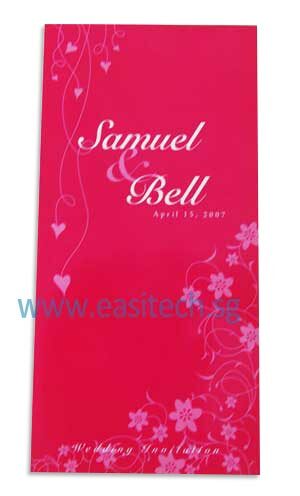 With a single side lamination, you could hand write your greeting or message on other side. On top of the matt lamination finishing, with the design of partial spot UV which will give your card stand out among the rest. With a single side lamination, you could hand write your greeting or message on other side. Click here to download greeting card template in adobe illustrator format.